Anytime you undertake a home renovation, you need a renovation budget to help you stay on track. Where should you begin with your renovation budget? We break it down into six simple steps. Our tips for home renovation ideas on a budget can help you stick to your goals and complete a renovation that makes you excited to come home each day. Whether you are renovating the home where you plan to put down roots, raise your family, and enjoy your retirement, or you are rehabbing a fix-and-flip property, setting a renovation budget is a necessary part of the planning process. Setting a realistic and smart budget that takes even the unexpected into account before you start your project is the best way to avoid getting in over your head and to make sure that your renovation brings you joy. Setting your renovation budget for your project involves doing your research, setting your priorities and the crunching your numbers; it also requires willpower and resolve to stick to your budget once the project is underway. If you create a thorough outline and budget following these six steps, you can set yourself up for success. In order to be successful in sticking to your renovation budget, you first need to determine how much you have available to spend, and what your ultimate goals are for your home. Are you trying to add value for resale in the next five years? Are you making upgrades that you plan to live with for many years? If you are renovating with a sale in mind, this will help you determine what types of upgrades are likely to provide you with the highest return on investment (ROI). Once you have a big-picture budget outlined, you will want to break it down and get really specific about the ways that your budget will be spent. You should factor in about 20 to 35 percent of your overall budget for labor costs, and you should set aside an additional 20 percent for your rainy day fund, which we dive into more below. You can (and should) keep track of all your figures in one place so they can be easily referenced. We recommend finding a renovation budget template online that works for your particular project. Why do you need a rainy day fund? Even well-planned projects are no match for the unexpected. When renovating, there is always the possibility that you will run into unforeseen problems. Outdated electricals may need to be replaced, or you might discover a leak in your old dishwasher has been rotting away your kitchen’s subfloor for years without your knowledge. Whatever the case may be, you will be better equipped to handle speed bumps like these if you hoard away a portion of your budget––about 20 percent––from the outset. One of the reasons that so many renovation budgets get blown out of the water is because homeowners have a hard time differentiating between needs and wants in the heat of the moment. When you begin your project, you should have a clear idea of what is most important to you, and what is least important. That way, if you need to trim the scope of the project to accommodate any changes in the budget, you know where to begin. Additionally, knowing your priorities will help you avoid the temptation of adding to your project along the way. You should get at least three quotes from trusted contractors before choosing one for the job. How do you find a trusted contractor? Ask family, friends and neighbors for recommendations, and then look up those recommendations on sites like Angie’s List or Yelp. When getting quotes, you should provide the contractors with as much detailed information as possible, right down to the exact materials and appliances you want to use. Ideally, the information you provide the contractors with should be so specific that the only difference between the three quotes is labor costs. How much does it cost to renovate a kitchen or a bathroom? It is really up to you and what you have room in your budget for. You can save money along the way with small adjustments that can really add up to substantial savings. While you are probably capable of doing some of the renovation work yourself (DIY painting is an easy way to knock a few hundred dollars off of your costs), there are other ways to save money here and there. Living expenses are often left out of renovation expense, but are nonetheless relevant if you live onsite. Staying in your home is a great way to save a significant chunk of money over the course of your renovation. Another thing to consider is the cost of eating meals out, especially if you are doing a kitchen renovation. For a kitchen renovation on a budget, you can meal prep ahead of time as much as possible, or, if it makes sense for your budget and time frame, you can set up a temporary kitchen in another part of the home while your kitchen is out of commission. Don’t try to overreach from the beginning or you will be set up for failure. You can use a renovation budget calculator or remodeling cost estimator to help you be realistic about your plans. Always be as specific as possible about what you want, from your vision for the end result to the little steps along the way. Resist the urge to deviate from your plan. Plan for unexpected expenses to rear their heads, and be prepared with your rainy day fund. Focus on what matters most to you or the items that will yield the highest ROI. If you are doing a bathroom renovation on a budget, focus on areas that will have the highest impact, like adding new fixtures. Have a backup plan for each item of the renovation. If you go over budget in one area, how can you reduce your costs in another to keep the overall budget balanced? Save money (about 20%) by buying materials and appliances yourself, rather than through your contractor. Use a home renovation budget planner and check it often to keep yourself accountable and on track. We all know that home improvement projects are infamous for busting a renovation budget. However, if you plan ahead, you can save yourself a lot of money over the course of your renovation. 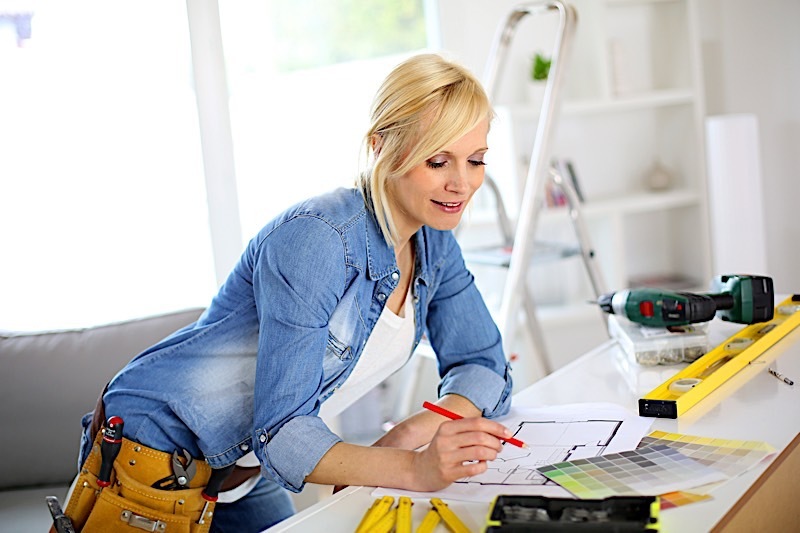 Have you ever tackled renovating a house on a budget before? Do you have any additional advice to share? Let us know in the comments.